The Fifa fitness test for referees and assistant referees consists of two parts. The first test is also called the sprint test and measures how good a referee can sprint 6 times over 40 metres. The second one is known as the interval test and measures if the referee is able to perform at repeated high-intensity during 20 sprints of 150 metres. Equipment required: ideally you have electornic gates that measure the time from passing the start and finish gates. A cheaper option is using a stopwatch. Other things you need are measuring tape, marker cones and a track of 50 metres. You also need an extra stopwatch for measuring recovery time. Procedure: The electronic gates (or cones) are placed with a distance of 40 metres. Before the start you need to place to cones at 1,5 metres. Referees can do a few steps to gain speed for a distances of 1,5 metres before the time starts to count. When using electronic gates a referee can start whenever he is ready and the equipment will measure the time. When using cones you need an assistant who gives a signal that a referee has passed the start line at 1,5m and someone who measures the time with a stopwatch at the finish line. Recovery time: Referees need to start their sprints every 90 seconds. So at 0m, 1 minute and 30 seconds, 3 minutes, etcetera until they have done six sprints. So the recovery time is 90 seconds minus the time needed for the 40m sprint. Fifa and national referees need to sprint 40m in 6.2 seconds. Fifa and national assistant referees need to do each sprint in 6.0 seconds. Female Fifa and national referees need to sprint 40m in 6.6 seconds. Female Fifa and national assistant referees need to sprint 40m in 6.4 seconds. The requirements for 2nd level (assistant) referees might be different per country. Check that with your national referee or football association. Failure: If a referee falls or trips, he is given the option for another 40m sprint. Totally a referee can fail at one trial out of six. Then he'll be given another option immediately after the 6th sprint. If he fails two sprints the match official has failed the test. Requirements: 400 metres athletics track, cones, measuring tape, whistle and stopwatch (or one of the pre-recorded audio files you can download below - then you need cd player or smartphone as well). Procedure: Cones need to be placed at the start and finish point of each 150m sprint. Between the sprints is an area of 50m where referees need to walk to the start of the next sprint. Cones also needed to be placed 3 metres before and after the finish line. This area is considered walking area. After the first whistle the contestants need to sprint 150 metres in a set time and need to arrive in the "walking area" on time. They walk 50 metres to the start of the next sprint. The rest time is also a set time, so referees need to wait for the next whistle. Referees run 10 times around the 400m track, which means they do 20 sprints of 150 metres. Fifa and national referees have to do the sprints in 30 seconds and have a rest period of 35 seconds. Fifa and national assistant referees ave to do the sprints in 30 seconds and have a rest period of 40 seconds. Female Fifa and national referees have to do the sprints in 35 seconds and have a rest period of 40 seconds. Female Fifa and national referees have to do the sprints in 35 seconds and have a rest period of 45 seconds. Failure: If a referee is not on time in the walking area he gets a warning. If he is too late for the second time he fails the test. 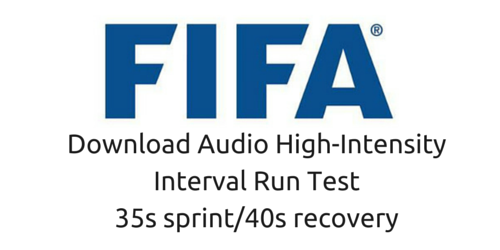 If you want to do the high-intensity interval test for yourself you can download the audio files below. Start and finish times are marked with a whistle. You'll also get a signal when a sprint or rest period will finish in 10 and 5 seconds. Pick the file that matches your requirements. These audio files are courtesy of the Toronto Soccer Referees' Association and published with permission. Thanks for giving permission to use them on my blog. I am Ngo Quoc Hung – Vietnam Referee! 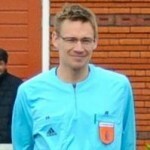 I like this website, because it is interesting for Referee! Thanks for your kind words. I hope to see you back on this blog. Hey There!I am also a referee as you.I am from Turkey.I am very glade to find this website all around the world.Because we are very big family who can speak by a whistle and a couple checkered flag.Thanx a lot for all of your sharing.Take it easy. I will always try to share useful content on the blog. Any wishes, Gürkan? l have really enjoyed this site .national referee from Uganda. Any tips for future stories? Yes, I think so too. Have you tried the test already? How did it go? Eish! these tests! I used to run 35s Sprint/ 45s Recovery. Now that I am a Category 2 Referee in Ghana, It’s going to be 35s Sprint/ 40s Recovery. It will be difficult but I am determined to do it. That’s the spirit, Franklin! Go for it and let me know how it went. Hi Janter since I started this program,I become a better referee,thank u for helping us.South Africa. That is good to hear! I wish you good luck with your referee career. Hi Mohammed, I will try to find some or otherwise draw some sketches. Hi am Francis Arthur, a referee from Ghana.Please i lent there is a new Fifa fitness test format for 2016. please can i have access to it audio for my training. Hi Francis, I’ll ask around about the new audio for this test and will update the blog post with those audio files. Thanks for mentioning it. That is great to hear by the way. I hope you’ll get some good tips every time. I will keep working on good stories for referees. Hi i am a Kenyan in Nairobi, i am in the process of becoming a referee in Kenya. Good luck with becoming a referee, Victor. When you start you don’t have to be able to run the FIFA fitness test most of the time, but it is important to train physically of course. That is a very good achievement, Comfort Modise. Not everybody will be able to do that. Please not that the test will change for next season. When I am a little less busy with Euro 2016 interviews I will publish it online. Hi, Jan i jst found this side and it’s amazingly helpful and will help us help others.God bless you . Am a elite B referee in Kenya.. Thanks for that. I will post more useful stories the whole year round. If you have any wishes, let me know. The test for assistant referees will be online at the beginning of August. Hopefully before the weekend. I wonder if someone can provide the version 30-30 seconds this is the most current.